A while back, I wrote a post called the absolute beginners guide to the art of seasoning. Wanting to keep things simple, like a good minimalist, I focused on seasoning with salt and pepper. But there is a whole lot more to the seasoning story. Like I said previously, seasoning is about improving the flavour of your food. And while salt & pepper are two of the most commonly used seasonings, we cooks have some other very important tools that are often overlooked. I’m talking about the balance of sweetness and sourness, or acidity, in food. While the warm and wonderful Thai people have been all over the balance between sweet, sour, salty and heat for ages, it’s something that I actually learned to appreciate during my years as a winemaker. At winemaking school we did many experiments where we would ‘doctor’ a wine with different types and amounts of acid. We’d then taste the different samples to see which ones were best. It was incredibly enlightening to see the difference that sourness played in the wine. It was more than just tasting more tart. At the optimal acid level the wine would be more bright and alive on the tastebuds. It would sing. But the other benefit was that the mouthfeel of the wine would change as well. If the standard was very low on acid it would tend to feel oily and flabby in the mouth. Add some acid and the change was remarkable. The very same wine could feel thirst-quenchingly crisp. It dawned on me, that the ability of acid to change flavour and texture must also be relevant in food. So I began to pay more attention to the use of sour things in my cooking as well. And I haven’t looked back really. 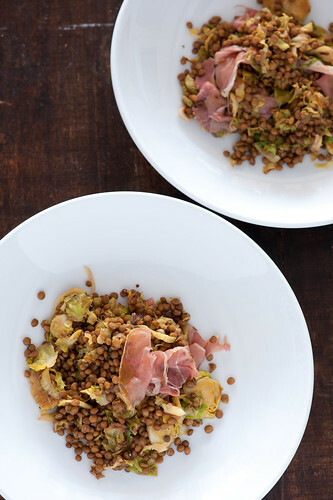 It’s amazing how a little vinegar can bring to life something like the canned lentils in the recipe below. On their own, they taste fine – all earthy and comforting. But with a little vinegar you have a dish that really shines. Try it for yourself some time. Most sources of acid for use in cooking have a unique type of flavour. Think of the difference between limes and lemons, or between a delicate sherry vinegar and a super-concentrated balsamic and pick the best one to work with your dish. While brown sugar can add a lovely caramelised flavour along with some sweetness, it can clash with the delicate freshness of something like a passionfruit dessert. 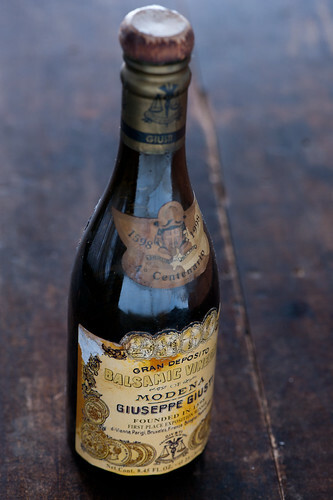 Then of course there is always balsamic vinegar which covers the sweet and the sour in one hit. While it can be easy to just reach for a squeeze of lemon or a spoonful of sugar, sometimes it can be more fun to add an element to a dish that will provide the sweetness or sourness you’re looking for. This can add variety so that not every mouthful is the same. I love a dish that has different bursts of flavour. Think about using fruit or dried fruit in savoury dishes. Or using acidic ingredients like fresh tomato, rhubarb, slices of lime or lemon or marinated anchovies for a little sour buzz. If you overdo the sweetness or the sourness, they can be used to balance each other to a degree. So if there’s too much acid, a little sugar can help and vice versa. But this is far from ideal. Better to season carefully and avoid the need for corrective measures. Don’t just assume that you’re going to need the sweetness or sourness. Taste first and ask yourself whether it is good as is or whether it would benefit from some more sharpness or more sweetness. When your taste buds have been exposed to something a few times, they become less sensitive to those flavours. So if you’ve been tasting and tweaking for a while, it’s good to have a break and a glass of water. Be holistic in your seasoning approach and remember the importance of s&p. If you missed it, there are a heap of basic seasoning tips over here. I need to confess that I’ve been developing a serious lentil addiction of late. And tinned lentils have been coming to the rescue on so many occasions. The secret I’ve found it to treat them gently and only cook enough to heat them through, otherwise they have a habit of turning into lentil mush. For a vegan version you could easily ditch the proscuitto and replace it with almonds or walnuts or even pecans. If you haven’t eaten pan fried brussels sprouts before, don’t be afraid. Unlike the over-boiled, smelly sprouts that my Mum used to cook, pan frying results in a lovely sweet, mildly cabbagey flavour. I’ve been able to convert many a sprout hater with this method, so be brave and give it a go. Heat a few tablespoons olive oil in a medium frying pan. Cook garlic over a medium-high heat for about 30 seconds or until starting to brown. Add sprouts and stir fry until soft and slightly golden on the edges, about 6 minutes or so. Add lentils and stir until warm. Remove from the heat. Taste and season with salt, pepper and the red wine vinegar. Scatter over proscuitto, if using. I love stir-fried brussel sprouts – so tasty! I’ve never tried them with lentils, sounds like an interesting combination. Chewing a piece of bread is another way to “clean” your tastebuds – especially if you’ve been tasting hot and spicy food. I am also going through a deep affection for lentils lately. Can’t wait to try this as I love pan fried Brussels sprouts as well. We would love if you shared more about wine as well. Excellent post. Sourness is something I don’t play with nearly enough in my dishes. I definitely need to branch out more (I usually just focus on lemon, lime, etc). Thanks! 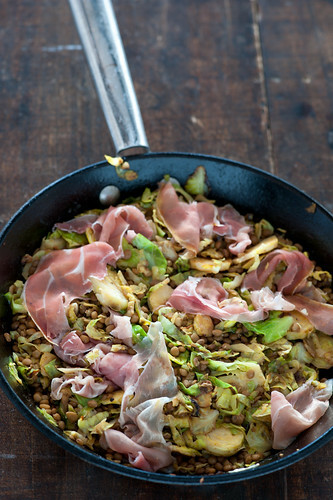 That looks amazing — and your suggestion of walnuts instead of proscuitto is genius! I completely agree about the use of “sour” in foods that you wouldn’t necessarily think of immediately – I add a splash of vinegar to more recipes than I realised (until I sat down and thought about it) – but I have to confess to a complete loathing of brussel sprouts – tried them boiled, steamed, stirfried (even chestnuts which I adore didn’t improve them).. cabbage on the other hand.. I can see this working a treat. YUM. And I hold you accountable for my lentil fixation – your lentil, beetroot and ricotta salad has a special place in my heart (and stomach thankfully)! I wasn’t just talking about chinese style ‘sweet & sour’ – more the general use of acid and sugar to season all types of cooking. but hope this post has got you thinking along those lines. aaahh the beets + lentils + ricotta – such a great salad. we’ll have to agree to disagree on the brussels sprouts but great suggestion to use cabbage instead. actually walnuts may be a better option all together. If you’re using lemon already you’re well on your way..
anything in particular about wine you’d be interested in? You know, it was a beet salad recipe that brought me to Stone Soup a little more than a year ago, and our shared love of lentils (something most Americans seem clueless about) is one of the things that keeps me coming back! Oh, and I’m with erin – how about some wine-pairing posts? OK, I’m inspired. I love Thai food for its delicate balance of seasoning, but the idea of playing with these flavors in my own little kitchen can sometimes feel daunting. So far, the only sour element that I’ve used is lemon. But after this little lesson of yours, I think I might experiment with some vinegar. Why not, I’m feeling a little adventurous. Thanks for this post! I think the thing is that playing with seasonings and balance sounds really complicated when you’re just thinking about it but once you actually muck in and give it a go it isn’t so bad. I should have said that it’s a good idea to ask yourself ‘what’s the worst thing that can happen’. another good idea when you’re starting out is to take a small portion of the dish and experiment with it first so if you screw up you haven’t ruined it all. Gosh, what a PRETTY dish that makes. Yum. thanks so much for reporting back. and really glad to hear I’ve converted you! We had to give up salt for a while because of High Blood Pressure. I turned to acid ingredients to make food taste better. I discovered a new world of cooking. Now, I wouldn’t be with out all types of vinegar, wine, lemon juice, lime juice, pickle juice, especially sweet (save it to pump up the flavor and different berry juices. I also discovered the various sweeteners too, like brown sugar, molasses, fruit juice. I enjoy cooking a lot more now and thank goodness, we are now able to add salt again in normal amounts. Lot of great tips on there! Thankyou so much for this wonderful information. I was recently very tired. A blood test showed I was extremely low in salt. I had always thought salt raised my blood pressure, therefore never added salt during the cooking process. Indeed I have been on salt tablets for the past month. Already feeling much better. Eileen. I didn’t know there was such a thing as salt tablets. Interesting!